Waterproofing is the process of making an object or structure waterproof or water-resistant, so that it remains relatively unaffected by water or resisting the ingress of water under specified conditions. Waterproofing elements include above/below grade, windows, joints, and flashings. Wet Glazing is the installation of glass using elastomeric sealants and butyl tapes to bed the glass and seal it at either face to the framing. Silicone and MS sealants are the most commonly used but polyurethane and polysulphide sealants are also used. One part moisturecuring, gun-grade polyurethane sealant. Durable, flexible, and offers excellent performance in moving joints. It does not require a primer on most construction materials. Designed for use in precast, masonry, window frame perimeters and similar types of construction joints. Multi-component urethane sealants for sealing and protecting moving joints of all types. Excellent flexibility and bonds to most substrates without priming. 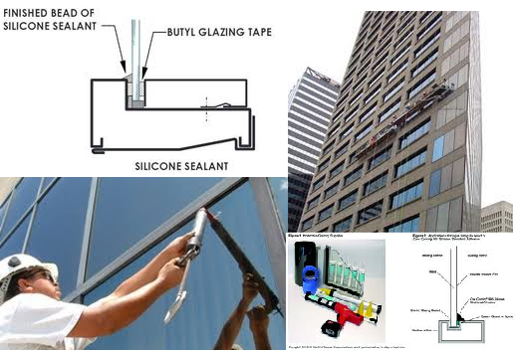 Used to seal windows and make glass installation easier.